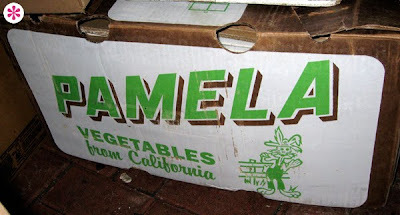 The Pamela part of this veggie box is so sweet, I’m willing to overlook the hillbilly rabbit. The name Mr. Champ is pretty effing awesome, I have to say. Sadly, the design has me thinking their name is Mr. Horse Ears. Or is it Mr. Horse Sh*t? Why is poor Mr Champ covered in blood? Really enjoy the type on Pamela, looks like epic vegetables could be in that box. But Mr. Champ the horse zombie would probably annihilate the hillbilly rabbit. Really. I think the only vegetable Mr Champ would eat is cauliflower, and that's only because a zombie horse can't distinguish between cauliflower and actual brains. mr. champ - ick. thanks for posting these! i love this blog and have been following for quite some time! Mr. Champ is very odd. I didn't even see the Mr. as being part of their name at first. 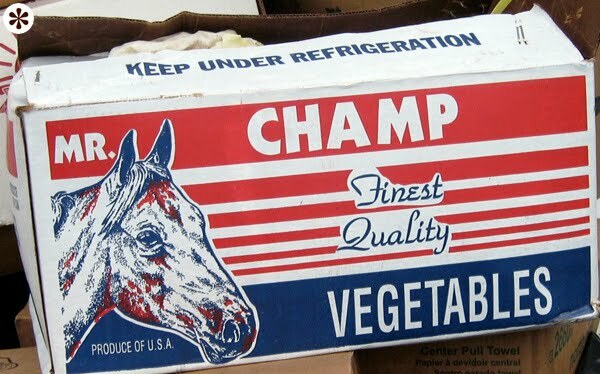 It makes me think that those vegetables are ones fit for horses to eat.